SpaceX was founded by Elon Musk in 2002 with a dream of making commercial space exploration a reality. Since that time, Musk has seen his company become a major player in the aerospace industry, landing contracts with various governments, NASA, and other private space companies to put satellites in orbit and ferry supplies to the International Space Station. But 2014 was undoubtedly their most lucrative year to date. In September, the company (along with Boeing) signed a contract with NASA for $6.8 billion to develop space vehicles that would bring astronauts to and from the ISS by 2017 and end the nation’s reliance on Russia. And this past week, the company announced a plan to expand operations at its Rocket Development and Test Facility in McGregor, Texas. This move, which is costing the company a cool $46 million, is expected to create 300 new full-time jobs in the community and expand testing and development even further. According to Mike Copeland of the Waco Tribute, an additional $1.5 million in funding could be allocated from McLennon County. This would give SpaceX a total of $3 million in funds from the Waco-McLennan County Economic Development Corportation, a fund which is used to attract and keep industry in the region. Copeland also indicates that a report prepared by the Waco City Council specified what types of jobs would be created. Apparently, SpaceX is is need of additional engineers, technicians and industry professionals. No doubt, this planned expansion has much to do with the company meeting its new contractual obligations with NASA. Originally built in 2003, the Rocket Development and Test Facility has been the site of some exciting events over the years. Using rocket test stands, the company has conducted several low-altitude Vertical Takeoff and Vertical Landing (VTVL) test flights with the Falcon 9 Grasshopper rocket. In addition, the McGregor facility is used for post-flight disassembly and defueling of the Dragon spacecraft. In the past ten years, SpaceX has also made numerous expansions and improvements to the facility, effectively doubling the size of the facility by purchasing several pieces of adjacent farmland. As of September 2013, the facility measured 900 acres (360 hectares). But by early 2014, the company had more than quadrupled its lease in McGregor, to a total of 4,280 acres. In short, the facility is the key testing grounds for all SpaceX technology. And now that the company is actively collaborating with NASA to restore indigenous space-launch ability to the US, more testing will be needed. Much has been made about the company’s efforts with VTVL rocket systems – such as the Falcon 9 Grasshopper (pictured above) – but the Dragon V2 takes things to another level. As revealed by SpaceX in May of this year, the Dragon V2 capsule is designed to ferry crew members and supplies into orbit, and then land propulsively (i.e. under its own power) back to Earth before refueling and flying again. This is made possible thanks to the addition of eight side-mounted SuperDraco engines. 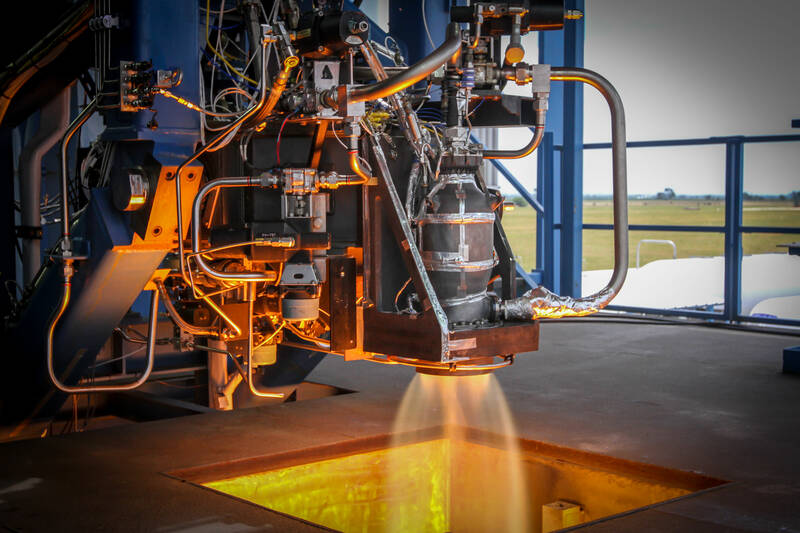 Compared to the standard Draco Engine, which is designed to give the Dragon Capsule (and the upper stages of the Falcon 9 rocket) attitude control in space, the SuperDraco is 100 times more powerful. According to SpaceX, each SuperDraco is capable of producing 16,000 pounds of thrust and can be restarted multiple times if necessary. In addition, the engines have the ability to deep throttle, providing astronauts with precise control and enormous power. With eight engines in total, that would provide a Dragon V2 with 120,000 pounds of axial thrust, giving it the ability to land anywhere without the need of a parachute (though they do come equipped with a backup chute). Between this and ongoing developments with the Falcon 9 reusable rocket system, employees in McGregor are likely to have their hands full in the coming years. The expansion is expected to be complete by 2018. No injuries are reported after a SpaceX rocket prototype detonated in Texas today (Aug. 22) after an anomaly was found in the rocket, the company said in a statement. The Falcon 9 Reusable (F9R) — a successor to the Grasshopper vertical take-off and landing rocket — was completing the latest in a series of ambitious tests that previously saw the prototype successfully testing new steerable fins. Screenshot of a June 2014 F9R test flight. Earlier today, in McGregor, Texas, SpaceX conducted a test flight of a three-engine version of the F9R test vehicle (successor to Grasshopper.) During the flight, an anomaly was detected in the vehicle and the flight termination system automatically terminated the mission. The next commercial SpaceX Falcon 9 rocket that’s set to launch in March carrying an unmanned Dragon cargo vessel will also be equipped with a quartet of landing legs in a key test that will one day lead to cheaper, reusable boosters, announced Elon Musk, the company’s founder and CEO. The attachment of landing legs to the first stage of SpaceX’s new and more powerful, next-generation Falcon 9 rocket counts as a major step towards the firm’s eventual goal of building a fully reusable rocket. Before attempting the use of landing legs “SpaceX needed to gain more confidence” in the new Falcon 9 rocket, Musk told me in an earlier interview. Blastoff of the upgraded Falcon 9 on the Dragon CRS-3 flight is currently slated for March 16 from Cape Canaveral Air Force Station, Florida on a resupply mission to bring vital supplies to the International Space Station (ISS) in low Earth orbit for NASA. 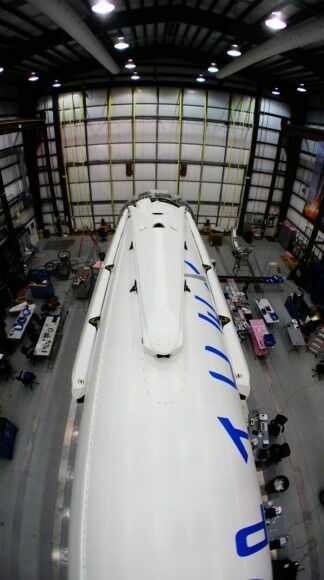 “Mounting landing legs (~60 ft span) to Falcon 9 for next month’s Space Station servicing flight,” Musk tweeted, along with the up close photos above and below. “SpaceX believes a fully and rapidly reusable rocket is the pivotal breakthrough needed to substantially reduce the cost of space access,” according to the firm’s website. SpaceX hopes to vastly reduce their already low $54 million launch cost when a reusable version of the Falcon 9 becomes feasible. Although this Falcon 9 will be sprouting legs, a controlled soft landing in the Atlantic Ocean guided by SpaceX engineers is still planned for this trip. “However, F9 will continue to land in the ocean until we prove precision control from hypersonic thru subsonic regimes,” Musk quickly added in a follow-up twitter message. In a prior interview, I asked Elon Musk when a Falcon 9 flyback would be attempted? “It will be on one of the upcoming missions to follow [the SES-8 launch],” Musk told me. “If all of those parameters combine in a negative way then you can fall short of the mission performance,” Musk explained to Universe Today. When the upgraded Falcon 9 performed flawlessly for the SES-8 satellite launch on Dec 3, 2013 and the Thaicom-6 launch on Jan. 6, 2014, the path became clear to attempt the use of landing legs on this upcoming CRS-3 launch this March. Atmospheric reentry engineering data was gathered during those last two Falcon 9 launches to feed into SpaceX’s future launch planning, Musk said. That new data collected on the booster stage has now enabled the approval for landing leg utilization in this March 16 flight. SpaceX engineers will continue to develop and refine the technology needed to accomplish a successful touchdown by the landing legs on solid ground back at the Cape in Florida. Extensive work and testing remains before a land landing will be attempted by the company. Ocean recovery teams will retrieve the 1st stage and haul it back to port much like the Space Shuttle’s pair of Solid Rocket Boosters. This will be the second attempt at a water soft landing with the upgraded Falcon 9 booster. The two stage Falcon 9 rocket and Dragon cargo carrier are currently in the final stages of processing by SpaceX technicians for the planned March 16 night time liftoff from Space Launch Complex 40 at 4:41 a.m. that will turn night into day along the Florida Space Coast. “All four landing legs now mounted on Falcon 9,” Musk tweeted today, Feb. 25. SpaceX has carried out extensive landing leg and free flight tests of ever increasing complexity and duration with the Grasshopper reusable pathfinding prototype. SpaceX is under contract to NASA to deliver 20,000 kg (44,000) pounds of cargo to the ISS during a dozen Dragon cargo spacecraft flights over the next few years at a cost of about $1.6 Billion. To date SpaceX has completed two cargo resupply missions. The last flight dubbed CRS-2 blasted off a year ago on March 1, 2013. The Falcon 9 and Dragon were privately developed by SpaceX with seed money from NASA in a public-private partnership. The goal was to restore the cargo up mass capability the US completely lost following the retirement of NASA’s space shuttle orbiters in 2011. SpaceX along with Orbital Sciences Corp are both partnered with NASA’s Commercial Resupply Services program. Orbital Sciences developed the competing Antares rocket and Cygnus cargo spacecraft. The Merlin 1 D engines are arrayed in an octaweb layout for improved efficiency. The next generation Falcon 9 is a monster. It measures 224 feet tall and is 12 feet in diameter. That compares to a 130 foot tall rocket for the original Falcon 9. Stay tuned here for Ken’s continuing SpaceX, Orbital Sciences, commercial space, Orion, Chang’e-3, LADEE, Mars rover, MAVEN, MOM and more planetary and human spaceflight news – and upcoming launch coverage at Cape Canaveral & the Kennedy Space Center press site. Did you take a moment to look at that August video of the Grasshopper rocket deliberately going sideways and then appearing to hover for a bit before returning to Earth? For more video fodder, there’s also this high-flying test the rocket took in October. We hope you enjoyed these views, because Grasshopper is being retired. SpaceX now wants to focus its energy and resources on to the larger Falcon 9-R first stage, which should see its first test flight in New Mexico this December. Grasshopper took eight test flights during its flight history, which spanned about a year between September 2012 and October 2013. It was intended to test Vertical Takeoff Vertical Landing technology (VTVL). The strange appearance of a rocket leaving Earth and gently, deliberately touching back down again turned heads — even in the general public. November 1, 2012: Flight to 106 feet (32 meters). December 17, 2012: Flight to 131 feet (40 meters). March 7, 2013: Flight to 262.8 feet (80.1 meters). April 17, 2013: Flight to 820 feet (250 meters). August 13, 2013: Divert maneuver! October 13, 2013: Highest test flight yet (2,440 feet or 744 meters). As for the Falcon 9 series, a rocket flight in September delivered its payload (which included the Canadian Cassiope satellite) to space successfully, but faced some technical problems with the upper stage — and the first stage, as the rocket was supposed to be slowed down for splashdown. As Space News reported, two burns were planned. The first worked, but the second burn took place while the rocket was spinning, which affected the flow of fuel. A picture shown by SpaceX demonstrated the rocket was intact three meters above the ocean, although it did not survive after it hit. “Between the flights we’ve been doing with Grasshopper and this demonstration that we brought that stage back, we’re really close to full and rapid reuse of stages,” Shotwell said in the report. This is an absolutely awesome view of the latest test flight of the SpaceX Grasshopper. The footage is shot with a camera attached to a hexacopter drone, and provides the closest view yet during a Grasshopper test of the operating rocket stage. During this test, Grasshopper flew to 744 meters (2,440 feet). Grasshopper is a 10-story Vertical Takeoff Vertical Landing (VTVL) vehicle that SpaceX has designed to test the technologies needed to return a rocket back to Earth intact. It consists of a Falcon 9 rocket first stage tank, Merlin 1D engine, four steel and aluminum landing legs with hydraulic dampers, and a steel support structure. While most rockets are designed to burn up in the atmosphere during reentry, SpaceX’s rockets are being designed to return to the launch pad for a vertical landing. “The Grasshopper VTVL vehicle represents a critical step towards this goal,” says SpaceX. On August 13th, the Grasshopper did just that, completing a divert test, flying to a 250-meter altitude with a 100-meter lateral maneuver before returning to the center of the pad. SpaceX said the test demonstrated the vehicle’s ability to perform more aggressive steering maneuvers than have been attempted in previous flights. While most rockets are designed to burn up in the atmosphere during reentry, SpaceX is looking to make their next generation of Falcon 9 rocket be able to return to the launch pad for a vertical landing. This isn’t easy. The 10-story Grasshopper provides a challenge in controlling the structure. The Falcon 9 with a Dragon spacecraft is 48.1 meters (157 feet) tall, which equates to about 14 stories high. SpaceX said diverts like this are an important part of the trajectory in order to land the rocket precisely back at the launch site after reentering from space at hypersonic velocity. Also on Twitter this morning, NASA’s Jon Cowert (who is now working with the Commercial Crew program) provided a look back at NASA’s foray into VTVL vehicles with the Delta Clipper Experimental vehicle,(DC-X). The video below is from July 7, 1995, and the Delta Clipper was billed as the world’s first fully reusable rocket vehicle. This eighth test flight proved that the vehicle could turn over into a re-entry profile and re-orient itself for landing. This flight took place at the White Sands Missile Range in southern New Mexico. But after some problems (fires and the spacecraft actually fell over when a landing strut didn’t extend) NASA decided to try and focus on the X-33 VentureStar, which would land like an airplane…. and that didn’t work out very well either. We had an action packed Weekly Space Hangout on Friday, with a vast collection of different stories in astronomy and spaceflight. This week’s panel included Alan Boyle, Dr. Nicole Gugliucci, Scott Lewis, Jason Major, and Dr. Matthew Francis. Hosted by Fraser Cain. Some of the stories we covered included: Pulsar Provides Confirmation of General Relativity, Meteorites Crashing into Saturn’s Rings, Radio Observations of Betelgeuse, Progress Docks with the ISS, Hubble Observes Comet ISON, Grasshopper Jumps 250 Meters, April 25th Lunar Eclipse, and the Mars One Reality Show. We record the Weekly Space Hangout every Friday at 12 pm Pacific / 3 pm Eastern. You can watch us live on Google+, Cosmoquest or listen after as part of the Astronomy Cast podcast feed (audio only). SpaceX’s Grasshopper flew 250 meters (820 feet) straight up, tripling the height flown on its previous leap. The video provides a great overhead view from SpaceX’s hexacopter. Via Twitter, SpaceX CEO Elon Musk said the Grasshopper was able to remain steady in its flight even on a windy day, hover and then land. SpaceX recently released video of the latest test of their Grasshopper Vertical Take Off and Landing Vehicle, where it rose 40 meters (131 feet), hovered and landed safely on the pad using closed loop thrust vector and throttle control. The test flight took place on December 17, 2012 at SpaceX’s rocket development facility in McGregor, Texas. 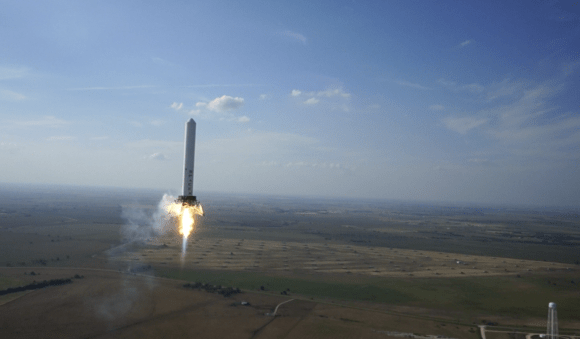 The goal of Grasshopper is to eventually create a reusable first stage for SpaceX’s Falcon 9 rocket, which would be able to land safely instead of falling back into the ocean and not being usable again. SpaceX said the total test duration was 29 seconds. Grasshopper stands 10 stories tall and consists of a Falcon 9 rocket first stage, Merlin 1D engine, four steel landing legs with hydraulic dampers, and a steel support structure.